purchased for me on Carnaby St. in London. If you loved fashion, you wanted to be her..
even when you were 10. 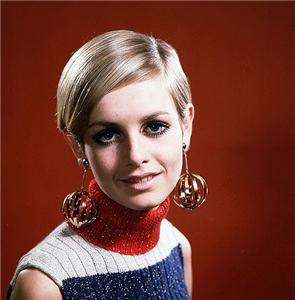 Her name is Leslie Hornby and her face launched the arrival of the teenage revolution and epitomized 60's swinging London. What was swinging London? It was a youth-oriented phenomenon that emphasized the new and modern. It was a period of optimism and hedonism, and a cultural revolution. In 1965, Diana Vreeland, editor of Vogue magazine, said "London is the most swinging city in the world at the moment." When this carpenter's daughter from Neasden in North London was 16, she was declared the face of 1966. Her story began with a push from a friend to see a 'woman' she knew to discuss a modeling job. Leslie took the idea with a chuckle and went to see this woman.Leslie was told that she was too small (5' 6 1/2" and weighed in at 6 1/2 stone/91 lbs.) but thought she had an interesting face and agreed to send her for some test photo shots. 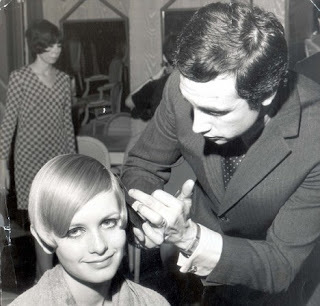 But first, Leslie was to see Leonard at the House of Leonard, a posh Mayfair salon for a trim and style. After their brief introduction, Leonard slipped away to phone photographer Barry Lategan. Leonard asked if Lategan could snap a few photos of this "girl". He wanted to do his new haircut on her but wanted to know if Lategan thought she was photogenic first. During her photo shoot, her then boyfriend Justin de Villeneuve, made the comment, "Oh Twiggy"(an obvious nickname due to her spindly frame). Photographer Lategan said, "Great name, if you ever model, you should use it". Lategan did the shots, called Leonard and said, "Yes she is photogenic, and yes do the cut". After eight hours of color and cut, photos were shot and ultimately Leonard hung them in his salon. The famous haircut that catapulted this waif to icon status. In Leslie's words from an interview with Swindle Magazine this is the rest of the story; "The next lucky break was that one of the most eminent fashion journalists of the day in those days, Deirdre McSharry, came in and loved the photograph. She worked for a national newspaper called the Daily Express. She was a client of Leonard’s. She said, “Love the hair. Who’s the girl?” And Leonard said, “A young schoolgirl.” And she said, “I want to meet her, I think she’s got something.” So I got this phone call at home. They said this lady wants to interview you. I was so green, I didn’t even know what an interview was. I went to meet this lady; we had tea. They took more pictures of me. She said, “I’m going to write a piece about you.” So every day for about two weeks, my dad would buy the Daily Express and there’d be nothing. We thought it’d be a little tiny column. Two weeks later, my dad came in. It was the whole center page. 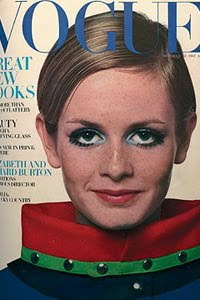 The headline was “Twiggy: The Face of ‘66.” It was the big headshot that Barry took. And that’s when my life turned around." 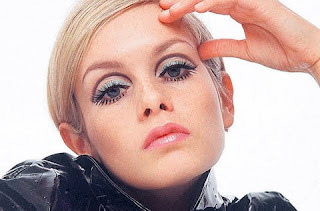 with her painted on bottom lashes and her doe shaped eyes..
she launched mod fashion. An era hard to describe nor to replace. way in the world. She still knows how to handle herself with a professional elegance and dignity." you were either a mod or a rocker. 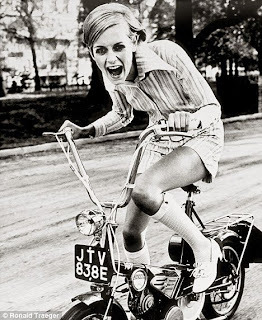 Twiggy was a self-proclaimed mod. "Twigg's used to come into Biba before she was well known, in great vintage pieces such as 40's coats with huge shoulders. I use to think, "God, that girl is amazing. She looks like Garbo." Despite all the celebrities coming into the shop, Twiggy was the one who counted; she was a superstar. We worked together making clothes for shoots and parties. 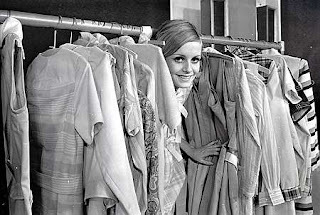 Twiggy modelling Biba make-up, doing the interiors for her dressing room for the pantomime Cinderella in 1974 and for her Notting Hill flat. I remember being in the back of the car with her on her way to appear on Parkinson and watching her slap on her make-up, her boots caked in mud, she didn't care. She was always terribly funny and very loyal." 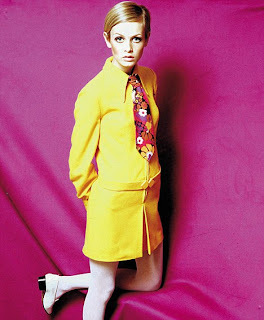 no other image represented the late 60's more than Twiggy's. 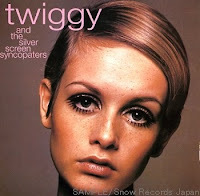 "The fact that people are still astonished at the success of Twiggy after all these years says it all. That invincible smile, the rock-hard confidence, despite her small frame, in a shrunken sweater and tiny skirt. Leonard, my hairdresser and friend, had shown me the Barry Lategan black & white snaps. Leonard was hoping this new face might be useful to launch his "little-boy" haircut - a haircut which, like her painted-on eyelashes, "the twiggies", became the waif look of the season. In the heady 60's, I liked not only working with her as a model (always easy to be with), but watching her grow (in inches too) and learn. She understood what the new wave of romantic designers, such as Kaffe Fassett and the late Bill Gibb, were doing. I remember her hanging her first Gibb frock on the wall of her flat like artwork. 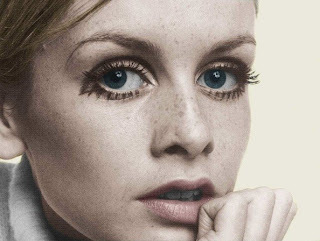 Twiggy had genuine charm, extraordinary application and was always the iron butterfly, coolly eyeing the main chance, never missing an opportunity to shine". 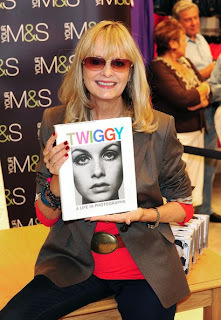 Deirdre McSharry, who discovered Twiggy when she declared her the 'Face of 66' in the London Daily Express. Tessa Traeger whose late husband Ronald Traeger, shot this famous 1967 image above for Vogue in Battersea Park, London; Twiggy designed her own 'mobile dress'. 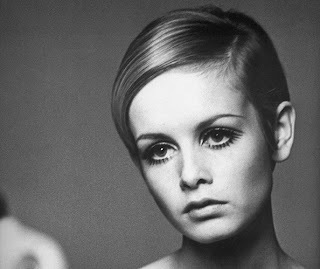 "Twiggy arrived on the scene unlike any other model before or since - smaller, thinner and with extraordinary charm that enchanted everyone then as it does today. Twiggy is unique and a wonderful model, and can dance like a dream. She is as fresh as she was on the first day, and brilliant. She will last forever." 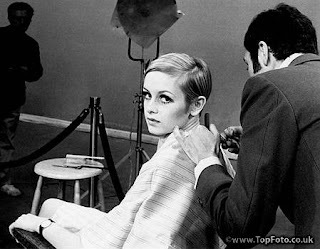 At the mere age of 20, & after just 4 years of modeling, Twiggy decided "You can't be a clothes hanger your entire life", and left modeling. She went on to stage acting, to perform in musicals, and act in films & television (winning 2 golden globes). 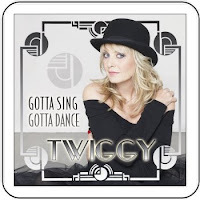 In 1976, Twiggy signed to Mercury records and released the albums Twiggy and Please Get My Name Right; she released another album, Midnight Blue. In 2007, Sepia Records released a previously shelved album that Twiggy recorded in 1979, Produced by Donna Summer and Juergen Koppers. To celebrate her 60th birthday, her newest cd, "Gotta Sing, Gotta Dance" was released Sept. 14, 2009. A sincere Happy Be-lated Birthday to you Twiggy for looking into your face brings back memories that endure a life-time. another totally groovy post! enjoyed it! Lots of wonderful images here and again informative post.. You always take me back to some forgotten love or interest. Fabulous post.. and of course a tribue to 'Our Jacqueline' haha... the other fabulous Pom!! Oh Deb, you little star...what a fabulous, smashing (as Twiggy and I would say) and wonderful post and thank you, for the lovely dedication. 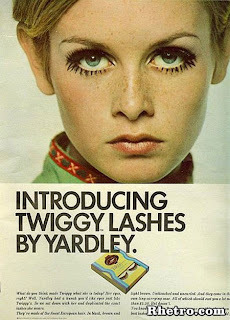 As you know, I grew up with Twiggy, and am just a few years younger.I was part of those 'swinging 60's' and frequented all of the places that you have mentioned, from the hairdressers to Biba(see my sidebar).I have painted eyelashes on my eyes and freckles on my nose, and wore nearly each and every one of the outfits that you have shown her in.I think that she has the most beautiful face, especially when she as 16, and now she is the face of Marks and Spencer, a very famoue British store, along with many other famous models, including Erin O'Connor,so,even at 60, she is still modelling (there's hope for me yet!!!! )I did have Mary Quant in my sidebar until yesterday, when I removed it 'cos I didn't like the picture! !My friends and I were so much part of London's Swinging '60's and you have brought back so many memories...I also had a pair of Hot Pants...mine were grey and I had matching grey suede boots, both of which would not look out of place today, not on me anymore, unfortunately !!! !we used to spend all day in Biba just trying clothes on and drinking coffee and chatting to everyone...it was a wonderful period of my life. I think of her every time I wander down Carnaby Street. I loved her. Those amazing eyes!! And she still looks wonderful! I think she is just wonderful ... now and then. She seems so genuine and lovely too. Terrific post Deb, really so interesting. What a wonderful bio, Deb! I absolutely love Twiggy (and loved her as a judge on ANTM!) and it was great to learn a little bit more about her. She looked great then and she looks great now! What a great collection of photos - I remember seeing her a couple years ago with the M & S ad campaign and remarking on how fabulous she looked! she made yellow FUN too! What a wonderful story! I never knew how she got her start. What a fascinating career she had. Just a great post! Totally thought I was following you..now i am! Have a good night & thanks for stopping by. i loved her too. and it was truly an awesome era. the best clothes for sure. Great profile...what an inspiration, xv. Her eyes kill me. She was/is just gorg! What a stunning post, darling! Well done! Really enjoyed the history and all these amzing pics! Not of that era, but love everything about it, mum always talked about her. Wow. What a fantastic post. 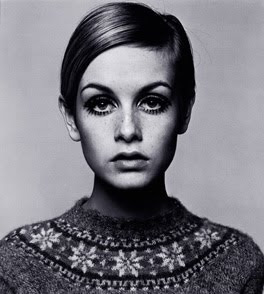 I adore Twiggy. She was beautiful then and still is today. Great photos. I loved seeing them all. You just brought me back during my student years in London. 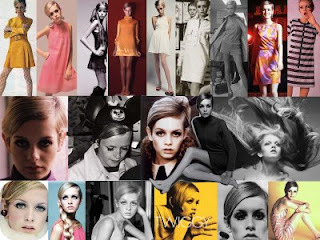 I absolutely adored TWIGGY and bought my first cosmetics at Biba. What an exiting world it was for the young french provincial girl i was. I was very skinny at the time and emulated her dress style, but unlike Twiggy, my hair was (and still is) dark, curly and unruly. I even cut my extremely long hair to a short bob at Vidal Sassoon...needless to say, it looked dismal upon the first rainy day. thank you so much for such a great story. I have just one request from above...can i please age as gracefully and still be hip at 60!! Deb-A wonderful post and she still looks great. I remember painting those lower lashes on with my Yardley makeup. what a wonderful post ~ she looks as fantastic today as she did 40 years ago! I love her eyes...its all about the eyes!! Very interesting post, I haven't thought of her in awhile!! Fabulous pictures....she is more gorgeous today...we all wanted to be like her even when we were 10....haha...Have a wonderful evening! A great post - Oh the magic of Carnaby Street! Twigs (that's my pet name for her) is a class act. The eyes, the pixie cut. Combine those assets with the Lauren Hutton gap and I'd probably pass out from jealousy.